ITS will be hosting MFA open house on campus between January 22 through January 25, 11am-2pm. At the booth the Information Security Office team members will be available to answer questions, and the BearHelp team will be available to provide in-person training to help faculty, staff and students enroll. Look for the ITS tent near the bell tower. 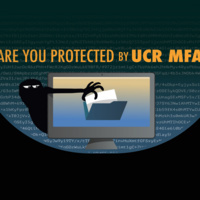 For those that prefer to enroll on their own, visit myaccount.ucr.edu to review the MFA options available and select the MFA method that best meets your needs. If you would like more information visit the ServiceNow Knowledge Base articles (goto.ucr.edu/kbmfa) for more specific information and enrollment instructions. For questions and support, please contact Information Technology Solutions at (951) 827-IT4U (4848) or BearHelp@ucr.edu.